Avie Bennett, publisher, philanthropist and dedicated supporter of PEN Canada, passed away on June 2, 2017. Douglas Gibson reflects on Bennett’s life, work and support of writers and freedom of expression. Avie grew up in a Jewish family in a Toronto where he saw signs posted on beaches that were “Closed to Dogs and Jews.” That experience shaped him, and was part of what drew him to the world of publishing, with its central belief that good books can make the world a better place. After making his fortune in the tough arena of Toronto real estate, he became helpfully involved in trying to save Jack McClelland’s indebted publishing company, McClelland & Stewart. In 1986, to his surprise he bought the legendary company. He liked to tell the story that having made this impulsive leap, he asked Jack what he should do now. Jack apparently suggested that he should try to hire the rival publisher of Macmillan of Canada, “young Doug Gibson”. He did so, giving me the first editorial imprint in Canada. Eighteen months years later, in September 1988, he hired me to take over as the publisher of M&S. 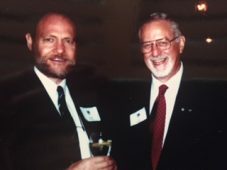 For the rest of his time as chairman and owner, until 2000, we worked side by side, spending countless hours together. This meant that I had a privileged view of Avie in action, and saw how his deepest beliefs affected the world of books. For example, PEN members will be interested to hear that when Salman Rushdie’s controversial novel, The Satanic Verses, fell under a fatwa issued by the Ayatollah Khomeini in Iran in 1989, it produced a march of enraged Muslims in Toronto, chanting death threats against the author. Avie’s reaction was to propose an instant campaign of resistance, where M&S, and every publishing company in Canada, would defiantly display the controversial book at their reception desks. We were prepared not only to do so ourselves, but to organise a Canada-wide campaign, but when we approached the book’s publisher, Penguin, they pleaded with us not to do so, for the safety of all involved. I’m not sure that they were right. In matters concerning freedom of speech, Avie was a solid defender of publishing freedoms, fighting against people like Conrad Black who were inclined to shut down embarrassing book investigations of their world. In the political arena, M&S was deliberately non-partisan, bringing out books by authors ranging from Pierre Trudeau to Brian Mulroney, and from Elizabeth May to Preston Manning. It was an ongoing demonstration of faith in the power of the classic belief that if you allow everyone to make their case in a careful, well-argued way, in the market-place of ideas the best case will win, eventually. As a boss, Avie was outspoken and frank. He was part of the editorial meetings that I chaired, where new book ideas were floated, sometimes successfully (“Why don’t we approach John Crosbie to write a book?”) and sometimes not (too many examples to give any details, including books that went on to success elsewhere). All of the management books about encouraging employee suggestions would frown on outbursts from Avie along the lines of “That’s the stupidest book idea I’ve ever heard” but it was accepted by us because it was Avie – the same Avie who would reprimand a famous author, and threaten to cancel his publicity tour, for being rude to a young publicist. The celebrity agent Michael Levine called Avie and me “The Odd Couple” because he was a very successful businessman, which I was not, he was Jewish while I sounded like an RCMP Corporal from Central Casting, he was a graduate from the School of Hard Knocks, while I was a fancy-pants literary guy who edited Robertson Davies, and he admired the finest liquor, while I was a prim tee-totaller. But we got along very well together, and published many fine books. I was proud to go to Sweden in 2013 with Avie as part of the group celebrating Alice Munro’s Nobel Prize. 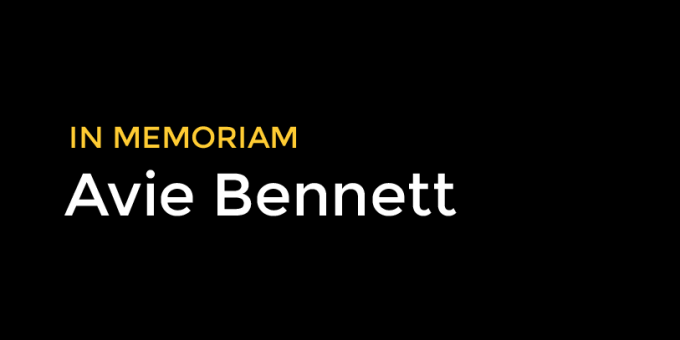 Despite all of his other achievements in many worlds that I have not been able to mention here, that event was a high point in the life of a great Canadian, Avie Bennett. Douglas Gibson worked with Avie Bennett at M&S as the Publisher from 1988 to 2000, then as the President till 2004. After he left the company in 2007 he became an author, with Stories About Storytellers (2011) and Across Canada By Story (2015). He is now touring the country with a new stage show, Canada’s Greatest Storytellers 1867–2017. Thank you for sharing this beautiful tribute to a man every Canadian should know about. Thanks, Doug. My deepest sympathy for your loss.